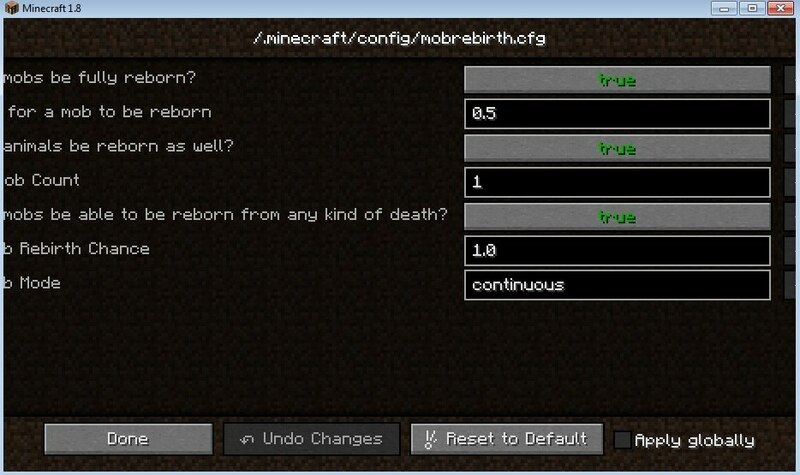 As of version 6.1.1, it is now possible to set mob rebirth properties in the config. Feel free to contact me with feature requests, requests for ports to different Minecraft versions, and just general questions about the mod. So do you actually have to use the egg to spawn it again, or does it automatically respawn in a specified location? I'd been looking for a way to get spawn eggs into my game. But I seem to be finding some ghost entities (eggs floating on the ground that I can't pick up). Any idea what could be causing that? Thank you for the speedy fix. I'll test it out right away. Seems to be working great, now. Any plans on making this support mods? It already supports creatures added by other mods, and it should support custom projectiles(Such as bullets from gun mods). Are there any specific issues with mod compatibility that you have seen? Just tested version 2.0.2 against Lycanite's Mobs version 1.9.0f. Ran fine together... except Lycanite's mobs don't drop their spawn eggs. Killed several hundred, in varying combinations of monsters and animals, and not one egg dropped. And yes, I'd reconfigured the settings so they did partial rebirth instead of full. Haven't tested any other modded creatures with this version, yet. But a previous version was tested against Twilight Forest's Moonitaurs, with similar results. Looks like a pretty cool mod! I'll be happy to apply and changes/fixes on my end if needed to make things work too! Can you please add in a config to turn the rebirth for mobs only and not animals? I have a 50% chance of mob rebirth, so whenever I kill mobs, it increases the danger- which is what I want. However, whenever I kill sheeps, I get more sheeps respawning too- which I don't want. Thank you in advance!!! I want this option - I want hard game. I have fixed this in version 1.1.1.0 for 1.7.10, and a 1.8 release with the fix will be ready in approximately 20 hours. "Kill one mob, and two pops out!" How's the update going? I hope this mod still holds your interest, as it holds lots of players interests too! Can't wait for automatically multiply Creepers when they blow up. I will keep that in mind. Tbh I haven't started the update yet, I have been busy working on another mod that I believe will be a massive success, as all others of its kind died at 1.6.4. I will start on the update today and hopefully finish by Sunday. Thank you for your continued interest in this mod- if you don't mind, what is this "other" mod you are talking about. Now I am intrigued to know what has been going on behind the scene. But Creepers dont reborn if they blow up. With "reborn from any kind of death" and "extra mob" with 1.0 chance, gameplay changes radically. Now, you must not fight monsters. You must save them. Can you please add option "zombies and skeletons don't burn at day"? There is zombie apocalipse at day now. I don't want to turn off "reborn from any kind of death". Also, reborned skeletons don't have crossbows, other monsters with weapons don't have weapons too. Why with this 'chance' settings, when mob dies, sometimes 0 mobs rebirth, sometimes 1, sometimes 2? I expected only 0 or 2 with 50% chance. 1 - bug or I don't understand? Is it going to update? I have new idea. When you kill someone, Wither will spawn. You can kill Wither, but you will think twice before kill some innocent sheeps. Maybe option to choose which mob to spawn or to spawn random mob. Separate options for killing and for other kind of death. # Whether or not animals can be reborn like mobs. # The number of extra mobs to be reborn. Leave at 0 to disable extra mobs being reborn. # Should mobs be reborn from any kind of death? If false, they will only die when killed by a player. # Chance for extra mobs to be reborn. # Extra Mob Mode, Options are 'continuous' or 'all'. Continual applies the chance per extra mob, All applies the chance once.